An Appalachian ghost story is one that has taken place in any one of the following states: Kentucky, Virginia, Tennessee, Maryland, West Virginia, North Carolina, Ohio, Georgia, South Carolina, and Pennsylvania. This mountain range is home to more than a few famous ghost stories, many of which have become legend. One of the saddest Appalachian ghost stories is that of Octavia Hatcher. Mrs. Hatcher had just given birth to her first child, Jacob, when she came down with a mysterious illness in January of 1891. Her little boy died just a short time after being born, and locals believed that Octavia soon began suffering from depression. The depression evolved into something much worse- a coma-like state. The doctors eventually lost their battle with this disease and Octavia died on May 2 of that year, or so they believed. Within several days, many people in town began experiencing a similar illness and also drifted into a sleep-like state. The town's doctor soon realized his mistake in the diagnosis of Octavia, and it dawned on him that she had likely been buried alive. The doctor ordered her body to be exhumed, and she was dug up that day. Much to their horror, those who opened the casket discovered that she had obviously died a terrible death caused by asphyxiation. There were scratch marks in the casket lid where Octavia had tried to escape. Mrs. Hatcher was re-interred in the same family plot. To this day, there are stories about a misty apparition around the grave. Local residents swear that they hear crying in the area near Octavia's grave site at night. Some say that it sounds like a kitten mewing, but no cats have ever been seen in the cemetery around her grave. 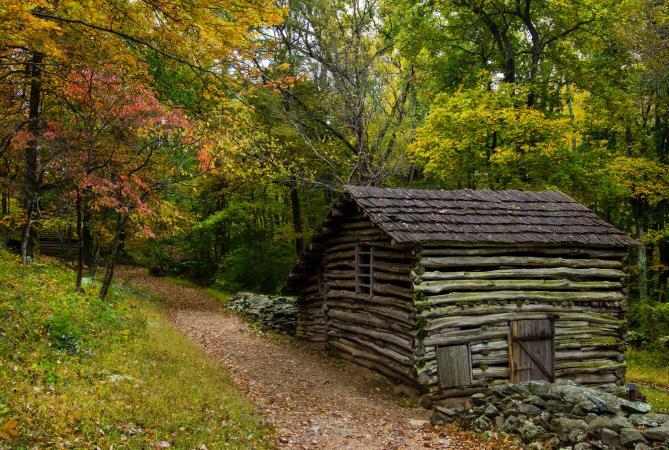 In the late 1700s a man named Joseph Baker built a log cabin in Wytheville. This cabin later became part of the foundation of the future Major Graham Mansion, built in the 1830s. Ghosts that are said to haunt this mansion include Joseph Baker and two of his slaves. Mr. Baker had promised the slaves their freedom upon his death. The two slaves decided to hurry this aspect of their release along and not only murdered their owner, but added him to a corn mash they were making in front of their cabins. When news of the crime spread, the two slaves were captured and hung on the property. Today, locals believe that these three ghosts continue to haunt the property. Once Major Graham took over ownership of the property, he also purchased slaves to work the land. Many believe that he had cages, chains, and even a guillotine in the basement of the mansion. While the story of the guillotine is unsubstantiated, local stories seem to support that he did keep slaves in the basement of the mansion, as many slaveholders did during this time. Paranormal investigators claim to have caught EVPs and video images of several ghosts haunting the property, including a young girl named Clara. Mrs. Graham did school a young girl named Clara in the home during the Civil War. The Charlotte Hall Veterans Home was built in the early 1700s. It was originally a school and then a military academy. Many students died there from sports accidents, drowning in the nearby pond and several heart attacks. While there have been rumors of a fire killing children there in the early 1900s, this story has been disproved. The children that apparently haunt the hallways and the pond are the accident victims. A plaque dedicated to one boy who drowned in 1909, Pierre, graces the entryway to the building. Built in 1859, this stately mansion was home to Mr. And Mrs. Christopher Smith. Mr. Smith was a riverboat captain and had also made his fortune raising tobacco. One fateful day, Mr. Smith went sailing on the river, in bad weather and was drowned. When news reached Mrs. Smith, she refused to accept it was true. She spent the rest of her days walking alone through the mansion and staring out the windows, waiting for her husband to return to her. Visitors to this historic mansion claim that they still see Mrs. Smith staring out of the upper windows of the mansion and believe the sight to be that of an actor reenacting the story. Individuals who work there will tell you that there is no such actor staring out the windows of the building. Whether urban legends or real ghost stories, these spooky Appalachian stories are sure to send a chill up your spine. As with haunted places all over the United States.